After two coats of varnish over the stain this is the result. Not too bad. The old wood is very variable in colour, some spots are much darker that others and I had to aim for a mid point with the stain. Nothing will hide the fact that this is new wood, but it doesn't have to go shouting "Look at me!". From the outside after grinding and sanding the resin residue. There is still some resin staining of the wood, but that won't affect anything. There were a lot of loose tacks on this canoe and I had to go over every single one to drive them tighter, and added or replaced those that stayed lose. Very tedious, there are hundreds of tacks! A coat if linseed oil not only helps waterproof the outside of the hull but it also keeps the wood from drying out excessively. 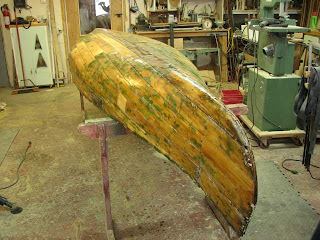 The fiberglass has already taken its tole on the wood. 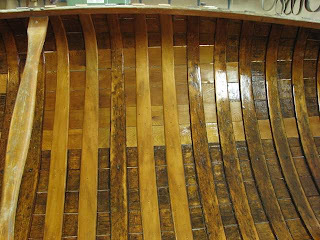 A nice shot of the original 1948 decks of this canoe. 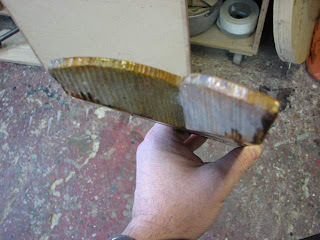 You can clearly see the camber on the top as well as the undercutting of the inboard edge typical of early Chestnuts. Posted by Doug Ingram at 11:12 p.m.